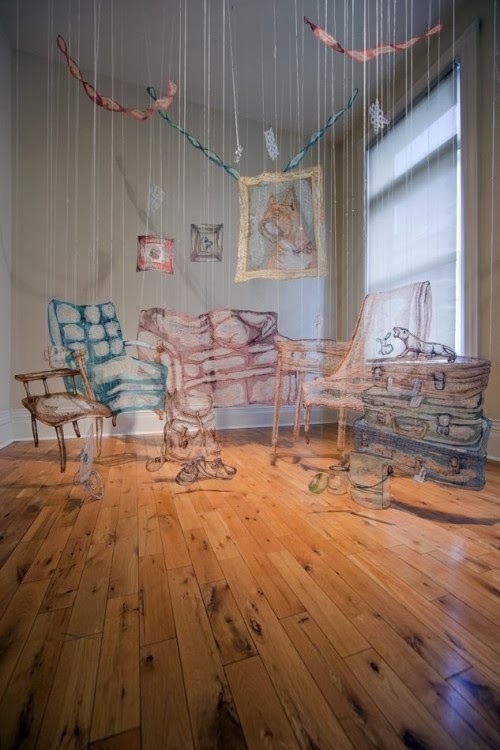 Room features large acrylic paintings by Martina MacFarlane and thread installation works by Amanda McCavour. This exhibition presents notions of the home as both a physical and en emotional space. I'm very pleased to offer an invitation to my first solo show. I'm honored to be having it at the Alberta Craft Council's Discovery Gallery from Oct 26-Nov30, 2013. My journey with fiber started with rug hooking. It opened my eyes to the wider world of fiber and I soon went on to learn and explore many other techniques and mediums including knitting, crocheting, wet and dry felting. A few years ago these parallel explorations began to merge as I developed my own techniques to bring knitting, felting and rug hooking together in my work. I created a new language that allowed me to express myself in a completely new way. Flat planes of color and pattern have become sculptural expressions with new stories to share. Diane also ha sguest blogged here and here. On a side note, Diane Duncan's group show at the Canyon Meadows Community Hall was attended by almost 500 people! A well rounded and diverse show, you can see some of it here. I was amazed at the variety of work! Terriea Kwong - international felting artist coming to Langley. Get excited...please help me give a big welcome to Terriea Kwong! She is coming to North America to teach many felt making classes! 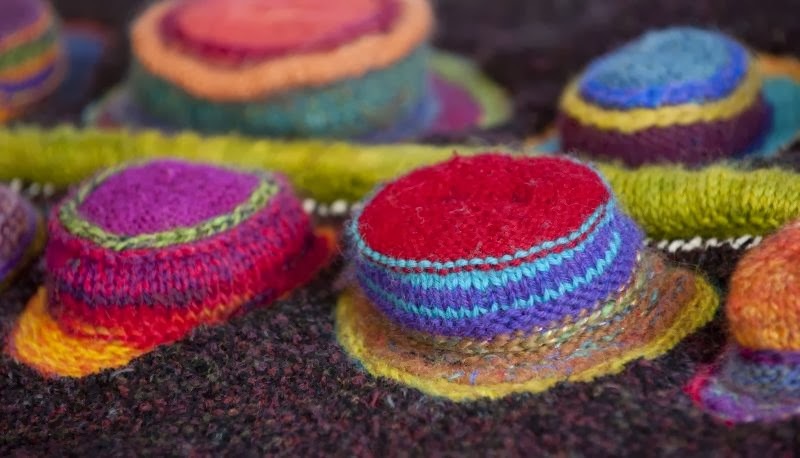 Starting November 25, Terriea Kwong will be sharing her expertise with us in making a 3D felt clutch purses, or a 3D vessels and/or Eco print scarves. Below is a sneak peak at Terriea's background! I love travel and nature. Natural and handmade crafts are my favorites. I enjoy the process of handmaking from ceramics to fabrics & fibres. Some years ago I saw a seamless wool pouch in a Cambridge crafts market and wondering how it’s made. My curiosity brought me to source the roots of felt making. Found wool a marvelous medium and addicted to felt making since 2009. My passion drives me to pursue and explore the versatility of wool. Wool felt is my favorite pastime and I’m very pleased to share with like-minded. Since 2009 I’ve offered almost 50 open and private workshops . 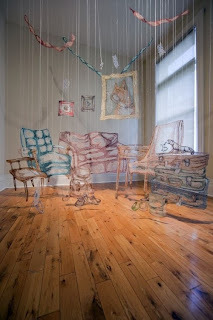 I love fibre art and have recently explored eco dyeing and printing. My works are inspired by nature. I like to do eco prints with leaves – the environmental friendly art. It’s fun to share the beauty of felting and tutorials via my blog http://terriekwong.blogspot.com. Please check out Terriea's blog to see all the wonderful pictures of her work. Using natural resources to create unique scarf with leaves prints. Students are taught to make prints with shades of rose leaves and eucalyptus prints on silk scarves. And while the bundles are boiling we will make a wool felt flower brooch or bracelet. The 3D hollow vessel will be a fun class learning how to make seamless items to hold many of your favourite things. Once you learn this technique you will have endless ideas for future hollow projects! If you would like to experience a wonderful time with Terriea Kwong who is a well known international felt maker please contact Sharon Gerhart at 604 916-7633 or email her at gerhart.sharon@gmail.com to book your seat! Seating is limited book your class now as classes will fill up quickly! The Arts for All Program is open to individuals, collectives and organizations and will fund art projects that will increase artistic activities and opportunities within the Greater Forest Lawn community. Preference will be given to applicants who are located in Greater Forest Lawn, although applicants from outside the community will also be considered if their projects value participation from local artists and community members as well as the participation of artists, organizations and community members from diverse backgrounds. Applicants are encouraged to connect with International Avenue BRZ early in their project planning to get acquainted with the community and learn about opportunities available, such as artBOX on 17E. The Artist Opportunity Grant Program is being piloted in 2013 and 2014 to invest in professional development opportunities for individual professional artists With no set deadlines for applications, the program will allow artists to take advantage of short-term opportunities that will develop their careers. GIVE IT YOUR BEST SWATCH! 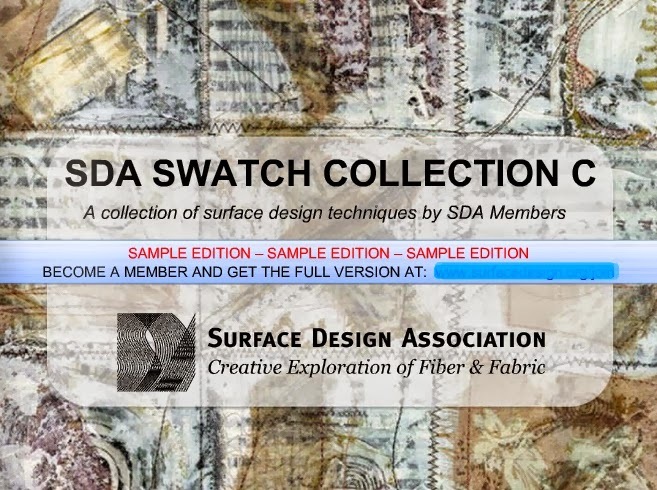 Contribute your work to the history of textile art & design. 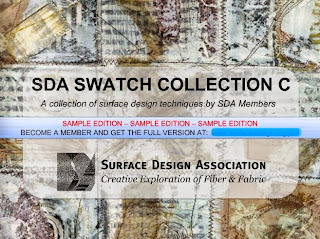 Now soliciting new swatches for "Best Of" Swatch Collection #4 - loaded with examples of innovative process, masterful application plus any downright gorgeous or distinctive fabric you've created. Anni Hunt has produced a video of an interview with Eleanor Hannan, whom many of you know either as an artist, friend or teacher. Thomas Roach and Sheila Wex gave a presentation last month at the Vancouver SDA show, about the Common Threads project. Some of you may be interested in following the progress of that project - check out http://common-threads-125.tumblr.com/ for lots of pics and information. We in the Lower Mainland will have a chance to see the completed masterpieces hanging in the Cathedral, in due course. We *will* be doing a "report" on the Oct 17th meeting with Lois Klassen and the "Slofemist Project", but are waiting for more photos and information! Thanks Arlee a great read... Lots to take in. We certainly are an active group of fibre artists in Alberta. Keep the information coming folks.